One of the seven eunuchs who served Ahasuerus and to whom the order was given to bring Queen Vashti before the king (Esth. i. 10). He suggested that Haman should be hanged on his own gallows (ib. vii. 9). According to R. Eleazar (Meg. 16a), Harbona had first been in league with Haman, but, seeing that his plot had failed, abandoned him. It is further said (Esther R. x.) 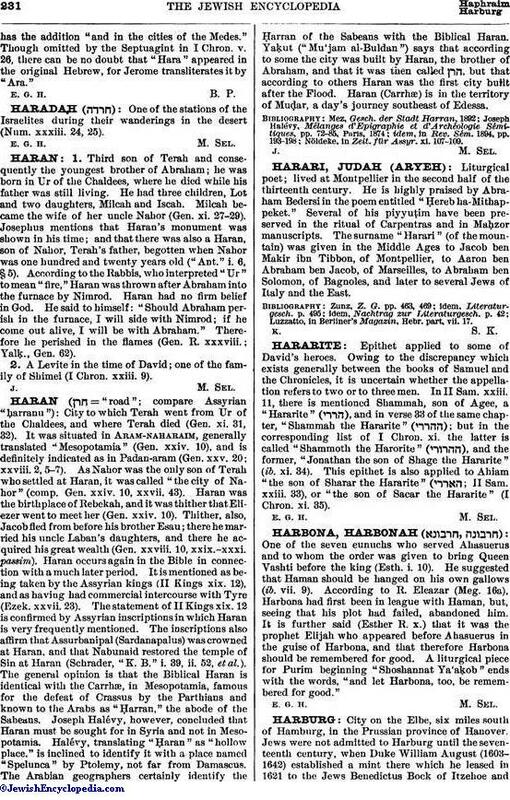 that it was the prophet Elijah who appeared before Ahasuerus in the guise of Harbona, and that therefore Harbona should be remembered for good. A liturgical piece for Purim beginning "Shoshannat Ya'aḳob" ends with the words, "and let Harbona, too, be remembered for good."